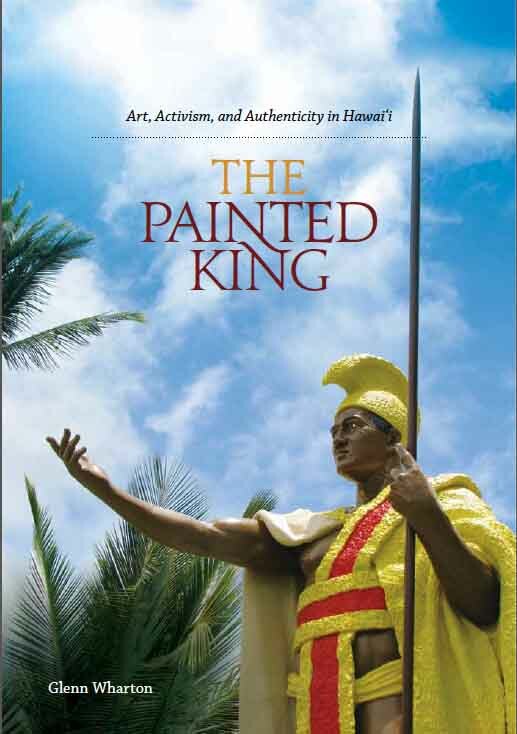 I just published a book which describes my cultural research during the conservation of the Kamehameha I sculpture in North Kohala, Hawai’i. My aim is to show how ethnographic and participatory research during a conservation project can reveal complex networks of meaning invested in cultural objects. It also demonstrates how relationships between people and objects can inform conservation research and the hands-on work of cleaning, coating, and repair. The sculpture is particularly charged with fused meanings and it has an amazing physical history. It was commissioned by King Kalakaua and the Hawaiian legislature to celebrate the centennial of Captain Cook’s “discovery” of the Hawaiian Islands at a moment when American business interests were advocating an overthrow of the government. 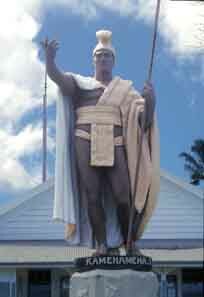 They chose to portray Kamehameha I as a “Pacific hero” in the stance of Augustus Caesar. Unfortunately the sculpture sunk in a shipwreck in 1880 on the way from Germany to Honolulu. It was recovered from the sea, purchased by a British ship captain in the Falkland Islands, and “restored” with a coat of brown paint over its gold leaf surface in 1883. Today it serves as a spiritual, economic, political, and cultural object. 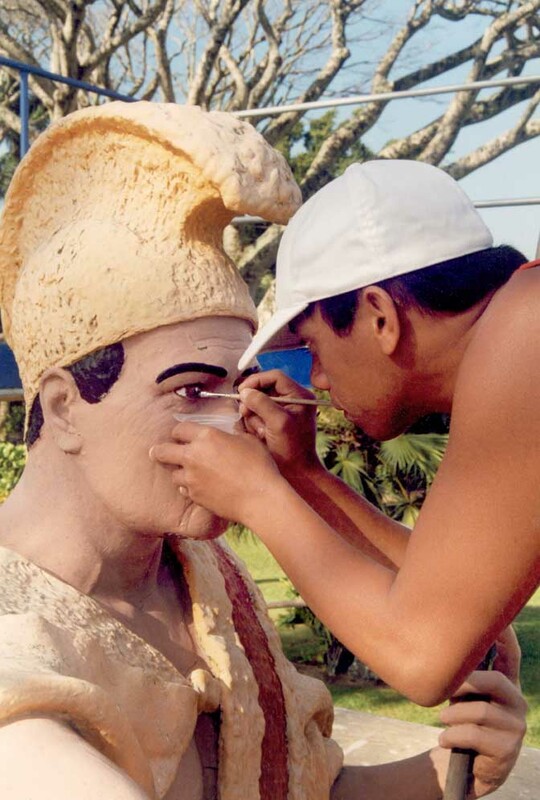 Local residents paint the figure in bright, life-like colors and honor it with gifts and a parade on Kamehameha Day, a state holiday. At first, the state asked me to strip the paint off and gild it, following the artist’s original intent. Honoring “artist intent” is standard in my field, yet in this case it meant stripping the bright paint off that is applied by local volunteers. I worked with local residents to create a multi-year community-based project to decide whether to honor its material authenticity (gold) vs. the authenticity of their more recent cultural convention (paint). Figure 3. Nalani Cabrera, a Kamehameha I descendant, removing the eyeballs during conservation treatment on the scaffolding. Credit: Glenn Wharton. We acquired funding for art activities in schools and wrote a puppet hula about the history of the sculpture, all to get people talking and thinking about the sculpture’s deteriorated condition and what to do about it. Gradually it became a “conservation object” as residents began to discuss its faded paint, corrosion, and whether to re-paint or gold leaf it. The question of gold vs. paint served as a window into issues of Hawaiian identity and how a multicultural community wanted to represent its Native Hawaiian past. After a series public meetings and activities, the community voted 71% to continue painting it after addressing corrosion and structural issues – which I did with local residents up on the scaffolding. The book chronicles the project and addresses larger concerns about public interest and the heritage conservation industry. 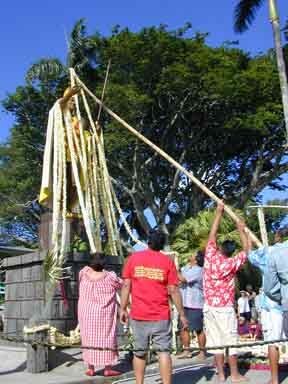 Lei draping ceremony by Hawaiian Studies high school students on Kamehameha Day, a state holiday. Credit: Glenn Wharton.